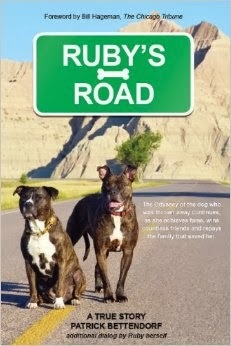 In RUBY’S TALE, author Pat Bettendorf chronicled the fate of a throwaway Pit Bull that rose from the mean streets to become a beloved service dog, national celebrity and the leader of his ‘Tribe’ of three humans and six rescue dogs. In RUBY’S ROAD, the writer and his eponymous heroine resume their adventures, winning heart and minds while grooming Sugar, a newcomer, who hopes to carry the load when Ruby decides to hang up her service vest. LIke the earlier book, this one revels in the day-to-day pleasure and treasures of the human-canine dynamic – a possum cornered in the yard, a turn onstage in a professional theater, a moving encounter with a misty-eyed WW II vet. These episodes underscore Ruby’s sweet, loving temperament, yet it’s clear that her human family is every bit as kind and caring, if a bit more chaotic. Thankfully, when disasters threatens to derail the Ruby express Ruby’s charisma, and anonymous angels combine to save the day. Like a home-baked pie, or wine with friends by the fireside, RUBY’S ROAD is the kind of feel-good book that goes down easy and leaves us feeling all is right with the world.